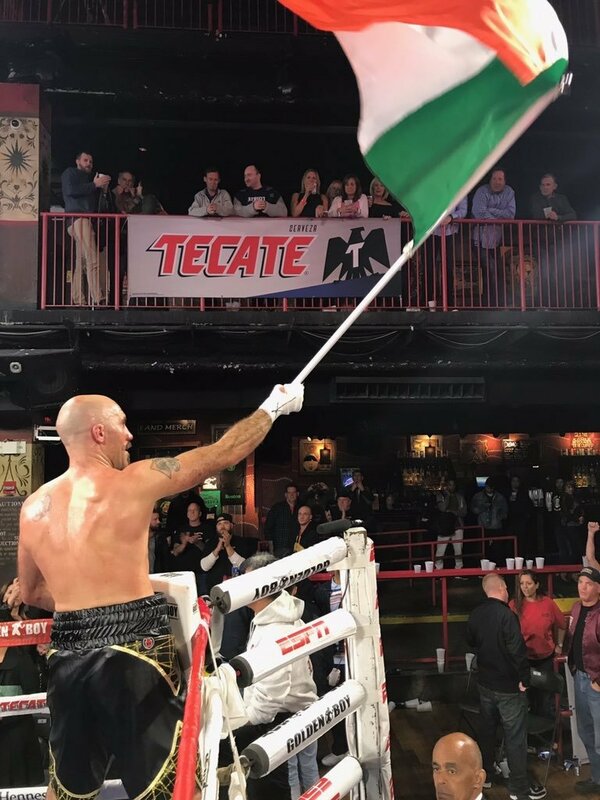 The fighting Irish illustrated the meaning behind the famous moniker tonight as Irishman Gary “Spike” O’Sullivan (26-2, 18 KOs) battled Englishman Nick Quigley (15-3, 3 KOs) to a fourth-round technical knockout victory in the televised main event on Golden Boy Boxing on ESPN. O’Sullivan and Quigley both came out swinging from the first bell and went toe-to-toe, with each fighter bloodied from the action. O’Sullivan received a cut as the two middleweights fought for dominance. Ultimately, the referee took note of Quigley’s decreased ability to stand solidly on his feet after a big right was landed by O’Sullivan and waved off the fight in the fourth round. In the televised co-main event, Filipino Recky Dulay (10-3, 7 KOs) was rocked and knocked down several times by Dandan Zenunaj (14-3, 11 KOs) in a super featherweight battle that was scheduled for 10 rounds. The referee stopped the fight in the third round, awarding the technical knockout to Zenunaj. Also part of the evening’s televised action, Brazilian Olympian Everton Lopes (6-0, 2 KOs) made his second 2017 appearance in the ring since returning from a layoff to battle Rafael Reyes (7-12, 5 KOs) in a six-round lightweight bout. The judges scored it a split decision victory of 59-55, 58-56, and 59-55, giving Lopes the nod as the winner after six-rounds. As part of the undercard live stream, Greg Vendetti (16-2-1, 10 KOs)scored a unanimous decision victory against Casey Kramlich (8-1-1, 4 KOs)in a scheduled eight-round super welterweight fight. Vendetti won with two scores of 80-72 and one score of 79-73. Raymond Moylette (6-0, 3 KOs)blasted veteran Michael Clark (44-18-1, 18 KOs) via second-round technical knockout in a scheduled six-round super lightweight fight. The Irish prospect was too much for the veteran Clark, forcing the fight to be halted at 2:49 of the second round. Shayna Foppiano (1-0, 1 KO)made a successful professional debut as she scored a first-round technical knockout victory against Lamarya Geary (0-2) in a scheduled four-round super lightweight fight. Foppiano made quick work of Geary, stopping her at only 1:36 of the opening round. Carlos Gongora (10-0, 8 KOs) scored an eight-round unanimous decision victory against Henry Beckford (6-7, 1 KO) in a super middleweight fight. Gongora won with scores of 79-73, 79-73 and 80-72. In the first bout of the evening, Mike O’Han, Jr. (3-0, 1 KO) scored a technical knockout victory against Demetrius Thomas (0-6) at 2:47 of the second round of a scheduled four-round welterweight fight. O’Sullivan vs. Quigley was a 10-round middleweight fight presented by Golden Boy Promotions and Murphy’s Boxing Promotions and is sponsored by Tecate, THE OFFICIAL BEER OF BOXING; Hennessy, Never Stop, Never Settle; and Interjet. The event was held at the House of Blues in Boston on Saturday, Sept. 30. The Golden Boy Boxing on ESPN coverage was streamed live via the ESPN app and on ESPN3 beginning 8:30 p.m. ET/5:30 p.m. PT and on ESPN Deportes at 10:00 p.m. ET/7:00 p.m. PT. Next boxing news: November 4: The Show will go on – but who will Deontay Wilder fight?